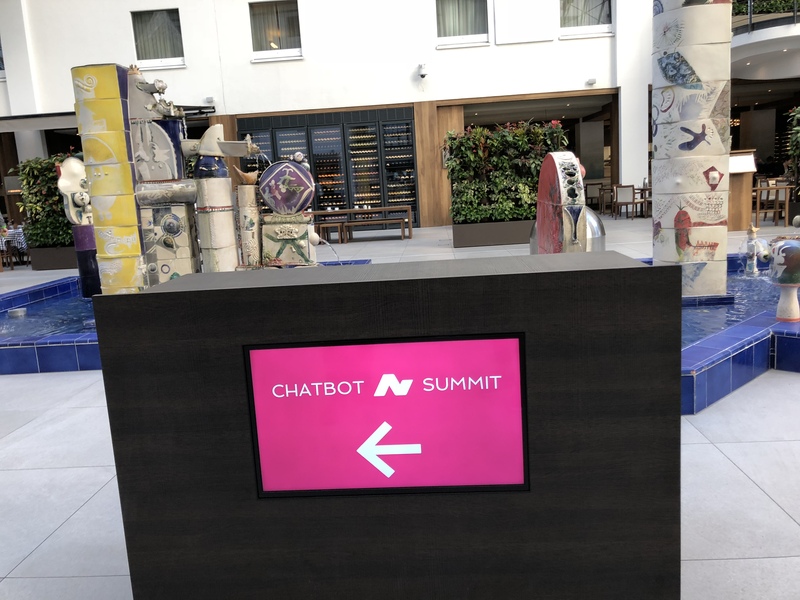 The Chatbot Summit held in Berlin on October 23rd-24this the world’s #1 bot conference and the place to be to get see the current trends in NLP, dialogue design, and over-all chatbot experiences! 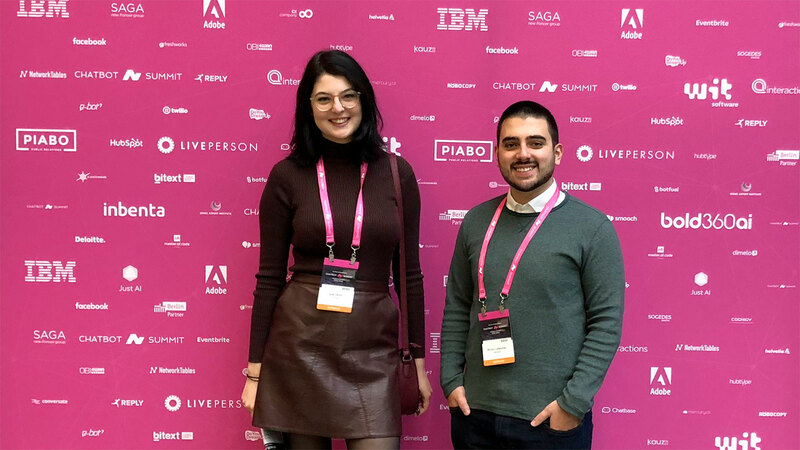 We – Bruno and Iulia – got to attend this awesome event on behalf of Mediaan and checked out the different approached to bots from start-ups, small, medium, and large companies! The two-day event started off with a day of workshops: more intimate presentations with practical outlook and tips and tricks one can directly put into their own bots. In the workshop given by RoboCopy we learned about the “uncanny valley”: the balance between making your bot “too” human with the risk of disappointing your client. Or not making it human enough; risking the user to avoid the conversation altogether. They also highlighted the importance of including empathy into the bot and present different evaluation techniques for how well-rounded your agent is. LogMeIn’s workshop addressed the importance of having feedback from clients in order to improve the bot. They presented the experiments and research they did into what can prompt a user to review their experience. They concluded that the key to increasing feedback was to seemingly integrate the act into the normal conversation flow rather than ask the user to fill in a conventional form. For example, the bot could ask “did that fully answer your question, or would you like to know more? “after a finished interaction to subtly introduce feedback. Lastly, the representatives of Ada Health used their healthcare/diagnosis app example to start a discussion on the importance of cross-language platforms. 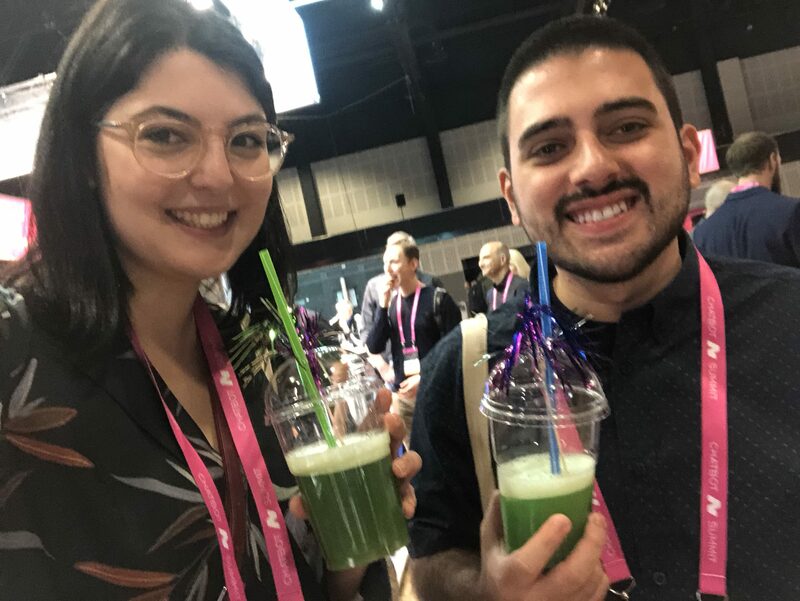 They explained how different concepts (especially specific to a field like medicine) are hard to translate, Nonetheless, it is still highly beneficial to offer each user the conversational services in their preferred language. 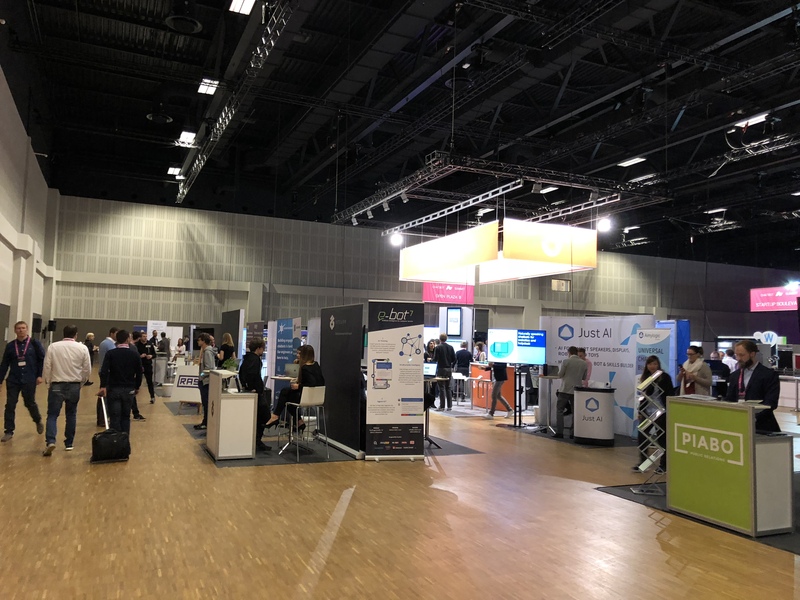 The second day brought about the main stage of more “major players” presentations that focused on inspiring the audience as well as showcasing well-established solutions. We’ve seen a demo of IBM Research’s Watson Assistant Solution and its many applications in industries such as automotive, hospitality, or retail. Google’s presentation “A Data-driven Approach to Building AI-powered Virtual Agents” showcased the importance of having machine learning in the loop. However, they predicted that “true” universal chatbots that could handle any types of conversation, have personality, or truly seem human are still a few years away. Air France lead the innovation for flight-assistant chatbots with their bot, Louis. 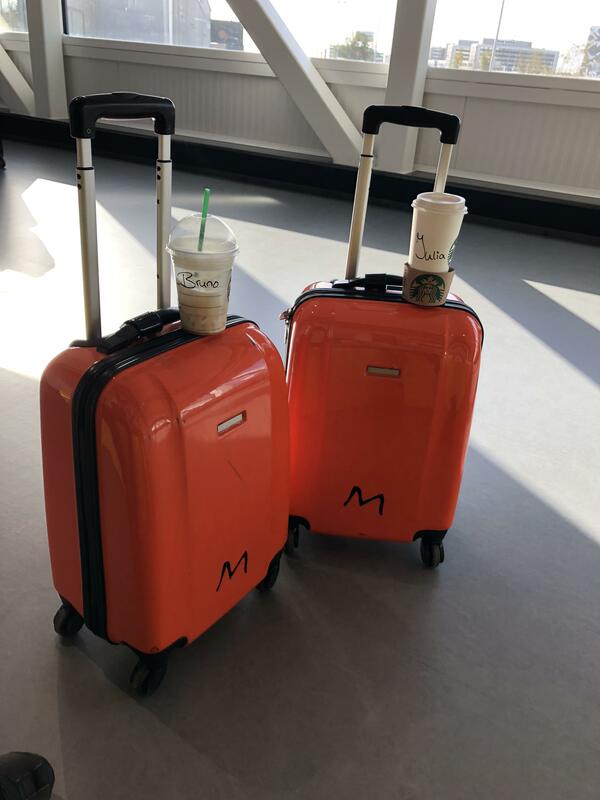 What started off as a bot aimed at the second most frequent topic in the field, baggage questions, now has its eye set on bigger things. Soon the bot will be able to suggest travel ideas and even use voice! This day also opened the exposition area where different companies brought their marketing and sales specialists and tech experts to make a case for their bot solutions. We’ve seen recurring themes like multiple platforms integrations (if it’s not on your favourite social media is it even a bot?) or complex dialogue flows (no one likes a stale conversation). 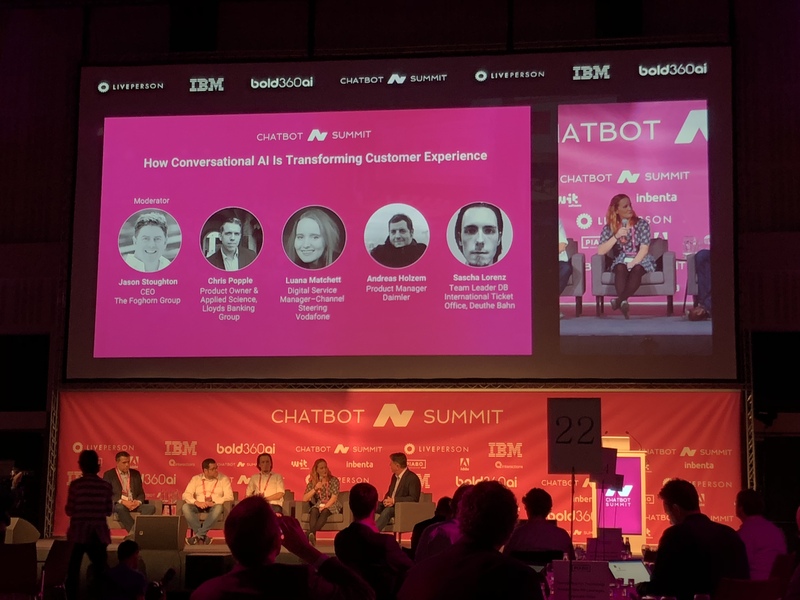 The latter referring to the new “way” of designing conversations: moving away from extensively pre-defined tree structures in a space where bots “understand” topic switches as well as the direction of a conversation through their natural language processing engines. Robots stealing our jobs? Fear not! If you’re uneasy with the concept of “robots stealing our jobs” fear not! Most solutions approached bots from a human collaboration perspective. There’s always a handoff point where an operator comes in to deal with more specific or sensitive user issues. The point of bots is to eliminate the mindless and repetitive steps out of customer care or other industries while allowing the human operators to best maximize their productivity and use of time. 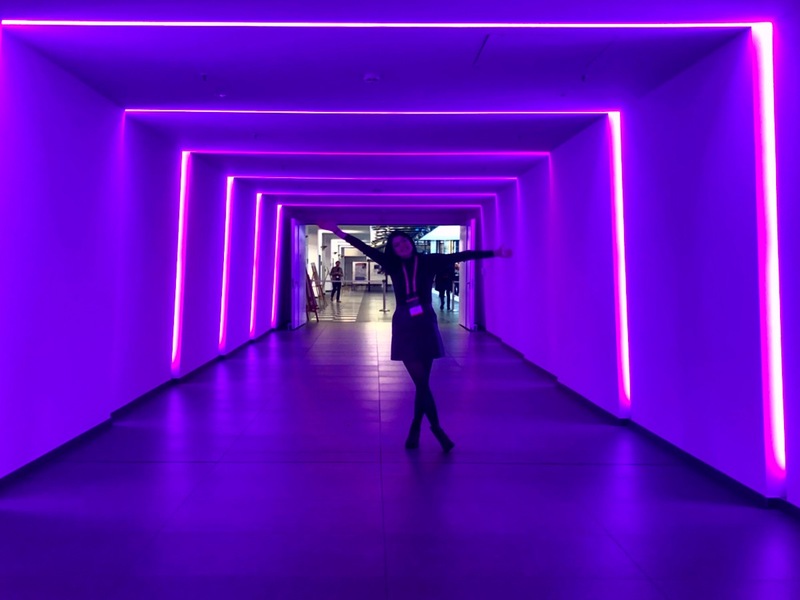 We’ve left the conference feeling inspired to make our bots sassier and more empathic, not underestimate social media, and somehow make everything more magenta?? (awesome light shows all around!) 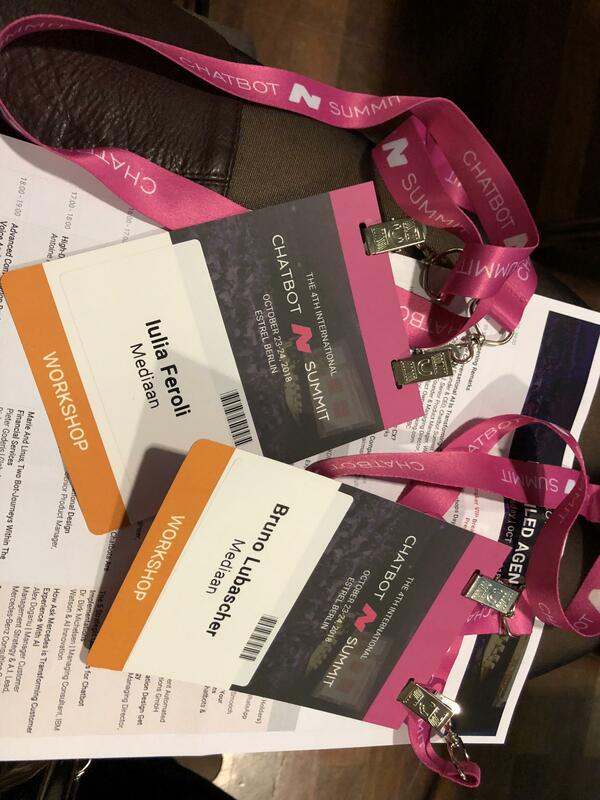 We also got the reassurance that Mediaan is definitely on the right track with our own AI platform, perhaps we’ll see you from the stage next year!